Various types of roti, are integral to Indian and Pakistani cuisine. * Sada Roti: Similar to naan. It is cooked on a tava, therefore the bottom is not crisp like that of a naan. 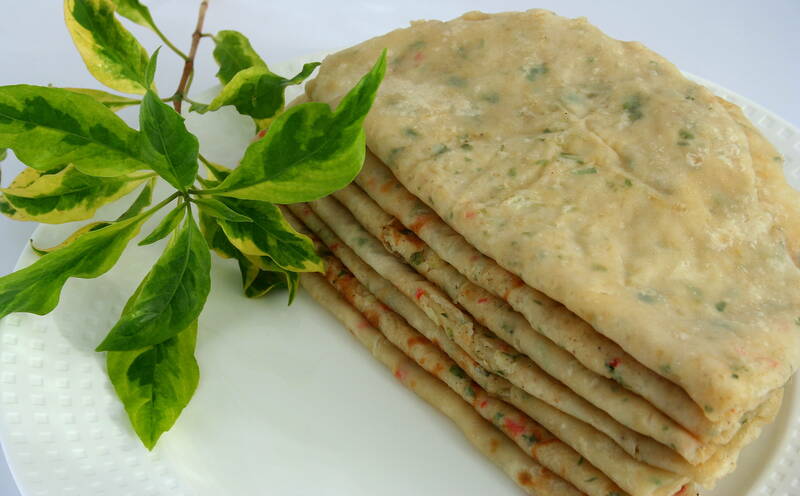 Because it is the easiest one to make, it is the most commonly consumed roti in Trinidad. It is a popular breakfast option in Trinidad, in combination with tomato choka, baigan choka (aubergine/eggplant/melongene), and other vegetable dishes. * Paratha Roti: A roti made with butter, usually ghee. It is cooked on a tava. Oil is rubbed on both sides, then it is fried. This gives the roti a crisp outside. When it almost finished cooking, the cook begins to beat the roti while it is on the tava, causing it to crumble. It is also called ‘Buss-Up-Shut’ because it resembles a ‘burst up shirt’. * Dosti Roti: A roti where two layers are rolled out together and cooked on the tava. It is also rubbed with oil while cooking. It is called dosti roti because the word dosti means friendship in Hindi. This type of roti is not made in Guyana. * Dhalpuri: A roti with a stuffing of ground yellow split peas, cumin (geera), garlic, and pepper. The split peas are boiled until they are al dente and then ground in a mill. The cumin is toasted until black and also ground. The stuffing is pushed into the roti dough, and sealed. 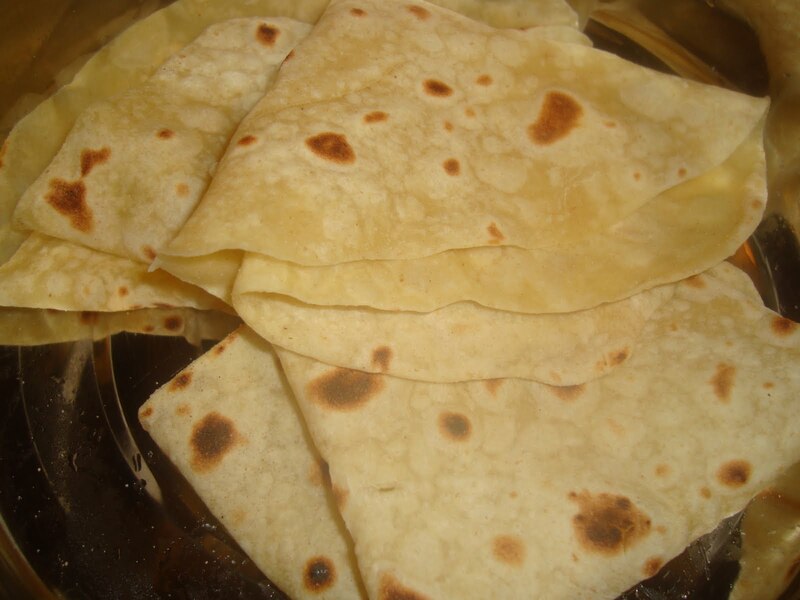 When rolled flat, the filling is distributed within the roti. It is cooked on the tava and rubbed with oil for ease of cooking. This is the most popular roti. Another version of this is aloopuri, which is made from potatoes. Check out this wonderful device for making rotis!